At PAX South, I was granted an exclusive look at Cabal 2, an upcoming MMORPG from ESTSoft that pulls no punches. When I asked about what makes it interesting – because, let’s face it, we’ve all seen this kind of game before – I was told quite simply that it’s the combat. Hey, at least they’re not trying to pretend they’re totally re-inventing the wheel, right? For my play session, I got behind the wheel of a warrior and his two-handed implement of death. As you can probably gather by the warrior preview video, it’s not exactly a subtle class. I usually charged into combat, spun my blade around with a healthy dose of single-target and AoE moves, softening up my enemies for the rest of the party to finish off. I’m not usually one to play melee DPS classes, but seeing that cluster of numbers over my enemies’ heads as they melted into oblivion was nice and satisfying. What makes Cabal 2’s combat stand out? It’s got combos, which might not sound like much, but the speed at which the “combo window” is open is extremely short, usually only a second or so. My first few encounters, I was taken aback at how quickly the window closed and I missed my opportunity for extra damage. Once I got the hang of things, my AoE chain devastated enemies, rupturing the earth in the process – a nice visual effect that contributed to my overall feeling of bad-assery. Yes, it’s a tab-target game, but there’s at least some aspect of the combat that will keep you on your toes. Cabal 2 also has dungeons, which is to be expected, but what if you don’t like those – or maybe you don’t mind the occasional dungeon, but the thought of grinding them nonstop to get the best gear is wearying? 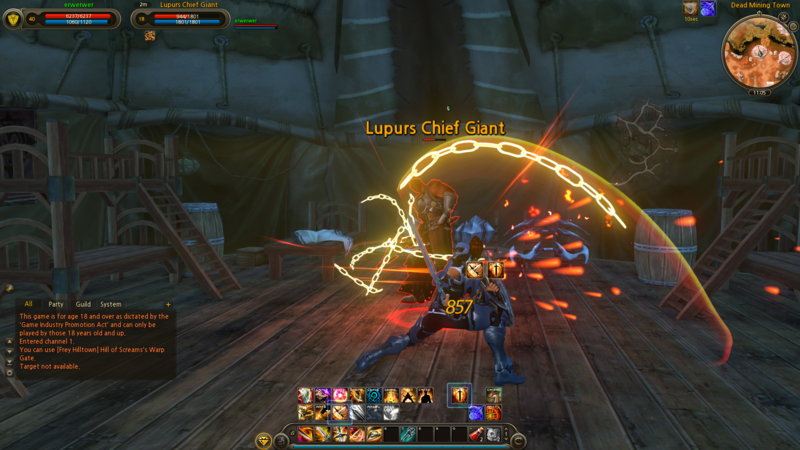 Cabal 2’s open world of Ektensia is dotted with Abysmo Points, which lead to challenging encounters that also drop tokens and loot, and you can buy gear with either Abysmo tokens or dungeon tokens. Having an option for how you gear up for endgame is a nice alternative to the standard gear grind. 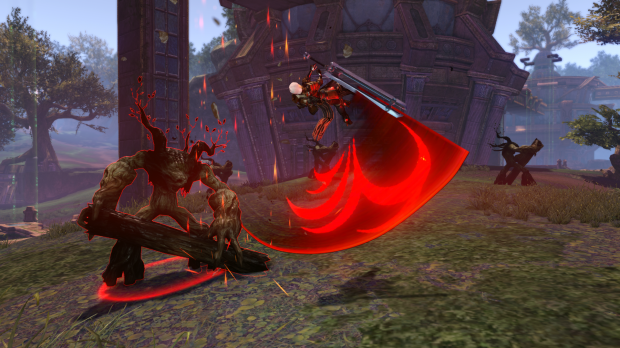 Other than PvE content, Cabal 2 will also offer a robust PvP scene with a twist. One of the PvP arenas we saw consisted of a number of platforms that are occasionally closed off by doors, leading to smaller team fights and the occasional unbalanced skirmish. I also wrote “18v18 MOBA-style PvP map” in my notes; I know I didn’t get a chance to look at that, but it sure sounds cool. One final part of the game that I had described to me, though I didn’t get to see it in action, was gathering and crafting. The gathering part is done automatically, and then your character goes to a special “crafting island” (which I assume has a name, but I just like the sound of “crafting island”) to do his or her thing. If nothing else, it’ll be nice to cut one of the mundane time sinks out of the game so there’s more time to do the fun stuff. Naturally, the cash shop and microtransaction plan was brought up, with the usual promise that it would be limited to cosmetics and accelerators. To date, only one company has ever told me directly that they sell power, so I would expect nothing less. This doesn’t mean ESTSoft is going to try and pull one over on us, but I knew it had to be asked, for the sake of thoroughness, if nothing else. There’s simply no way to judge a game’s cash shop until it goes live. My brief play time was limited to max-level action, so I didn’t get a chance to see the leveling content, but I’d also expect that to be the usual fare for this type of game. The western port of Cabal 2 goes into closed beta this spring, and if it sounds and looks good to you, you can sign up on the website. It looks to offer loud, fast-paced, and hard-hitting combat, with a few twists to try and differentiate itself from the crowd. i agree RIFT is good but not THAT good to overshadow cabal or blade and soul . The last time I heard news about this MMO was decades ago…I think they’re a bit late. Its called exaggeration, he still has a point, this was announced a long time ago and doesnt seem it will be better than most of the games that are soon to be released, if anything this game will only attract some fans from the first game. It might’ve been released 7 years ago but it looked older than that. The visuals for the original cabal were awful bro. Face it, Cabal 2 missed the boat. Agreed!, tried Cabal Online, didn’t liked it, never played again. 5 years since its firs announcement as a project is not the big deal y you see the development time for videogames now a day. I don’t like to say if a game ¨missed a boat¨ before I tried it. When they release Open Beta for Cabal 2 I’m gonna install it and try it. I know that chances are it’s gonna be another generic Asian MMO, but I wont say so if there is no way I can know for sure. It needs work… where is the dual blader class?